wandering in night gowns, frothy bubbles, and folded legs, This is my November. A 30 day stretch of sleeping, whispering in ears, and collecting words of elsewhere. I am saying goodbye to the month of repose, and wishful thinking. My slumbering days are over, I want to be young and foolish. As December lingers on the horizon, brilliant white sands will soon fall from the sky. My birthday will soon arrive, and I'll be raking, and combing to find a time machine. The years just slip away, like a forest animal on rotten ice, or frozen cream on a sunny day. I'm mulling over thoughts of a party. Maybe, it'll be a gin sipping-banjo slapping--- gathering of nice people. Maybe, speech slurs at a folk concert. Maybe, it'll be a slow dance at a bar... Any suggestions? Most of my birthdays are quiet. A time spent with family spirits, my favorite snacks, and bottles of wine. This year, I am tempted to mingle my hands, and celebrate my 19th birthday, foolishly. Calgary folks have been charmed by a long Autumn. We've been far away from quilts, and closer to sun beams. The streams are still ebbing, and wet. The hilly lands are blanketed by grass, and dust. The rooftops are dry. My headache has traveled west, catching someone else's misfortune. December will come, and my days will be spent awake, alive, and well fed. What a pretty look and lovely flower piece! 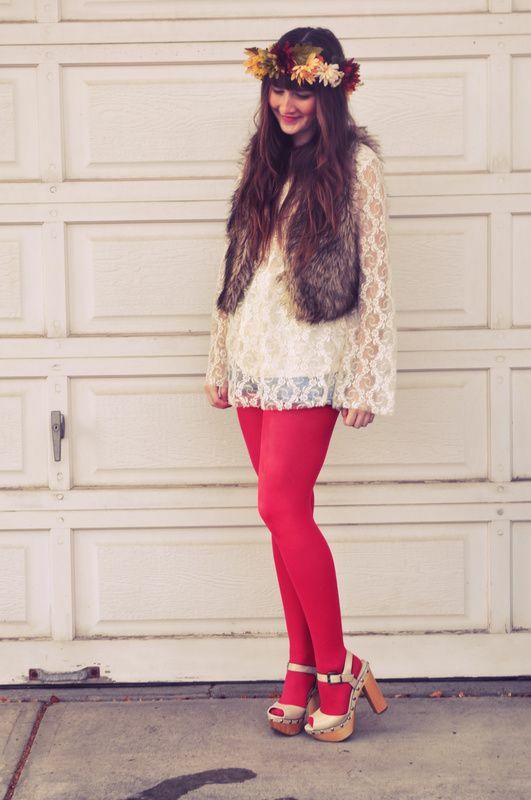 Loving your red tights too...so fun and festive! I hope you have Happy Birthday around the corner too!!! This is so beyond words pretty! Gorgeous outfit! The pink tights really make your outfit pop. The flowers are a beautiful as well and I love the lighting. Sooo lovely beautiful and chic.! <3 =) Absolutely gorgeous! 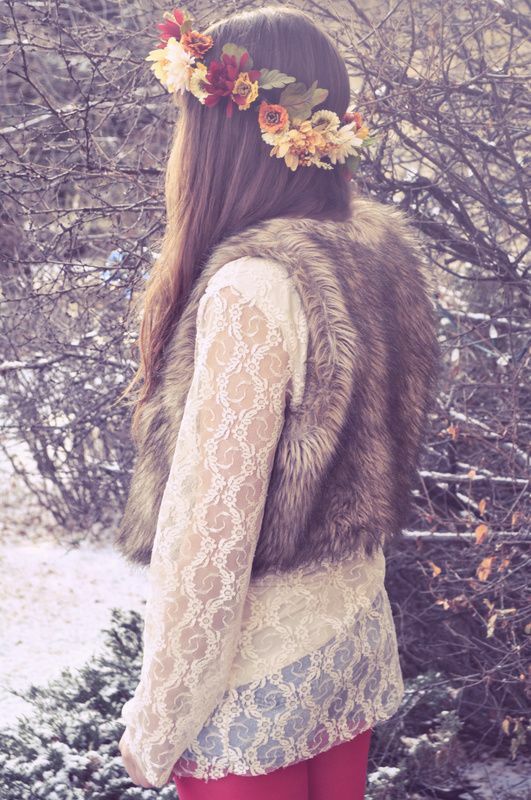 I love the flower head piece and fur vest! I love this outfit Amy! So beautiful!! This is like a dream I had. 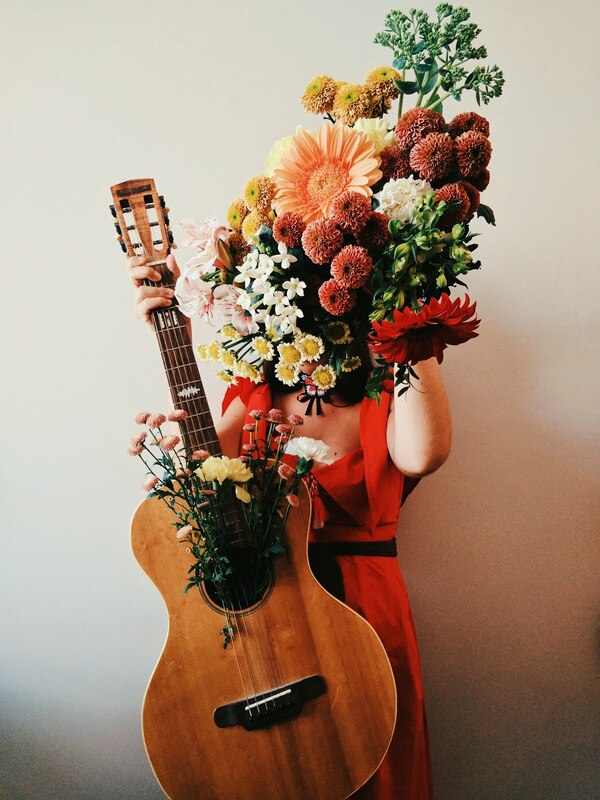 The girl had flowers and your face. 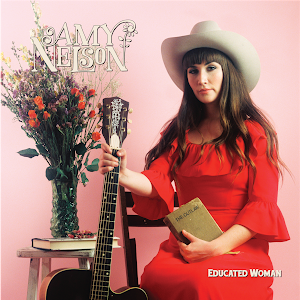 So I guess it was a dream about you amy! The pictures of you outside are beautiful. I love the lighting and the fur with the flowers. Super pretty. amazing! your floral headband is gorgeous! love your style as always! that crown is STUNNING! you did a wonderful job making it. The floral crown is super cute! How beautiful! I hope you have a glorious birthday, filled with laughter and smiles. your floral headband is so cute! ive been wearing on this week too! This is such a beautiful post! How I adore your floral crown and luscious hair in particular! Your outfit and make up, too, are wonderful. 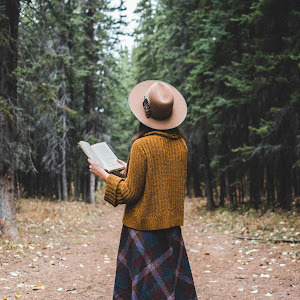 dear, your blog is wonderful! You can't imagine how much I like it! Your style is so cute!!! Without doubt, FOLLOWING! 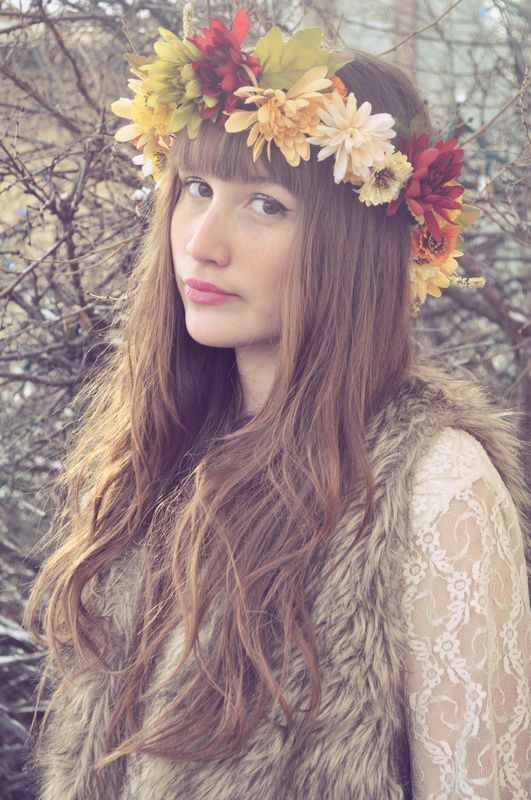 considering im pretty much obsessed with flower headbands i LOVE these photos! 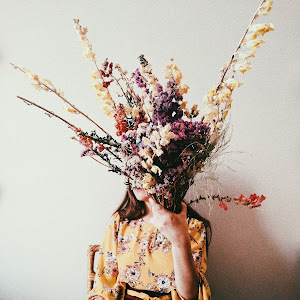 Beautiful flower crown, great photos. You look marvellous! and I love the crown! 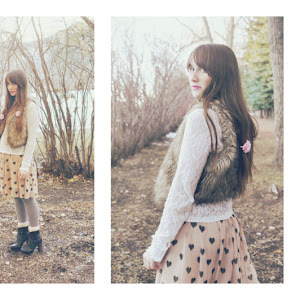 Lovely outfit, I really like the furry vests trend:) And this handband of flowers...<3 precious! wow ! great look! love the way you style your hair...looks amazing! you look so dreamy in these pictures! i love the floral crown! it goes beautifully with this outfit! precious U gotta show us how made you made that! 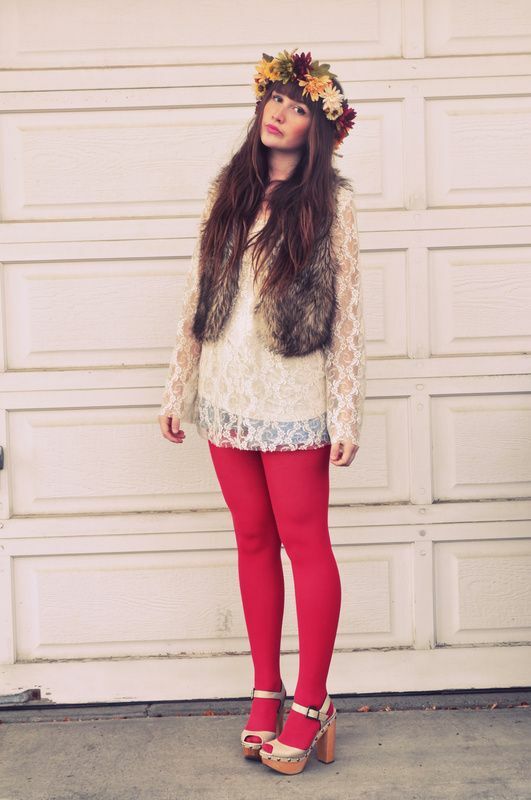 I really love the bright red tights with your lace dress. 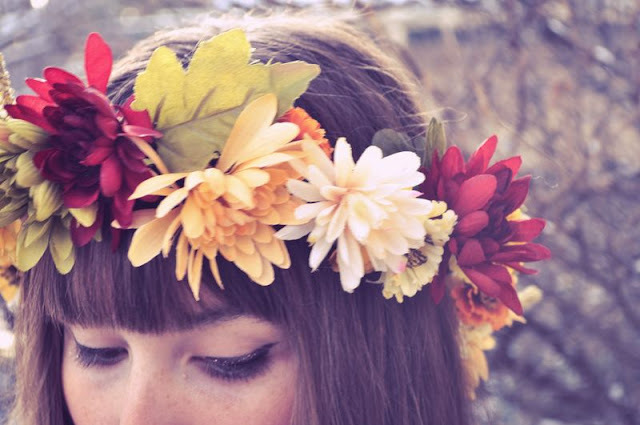 The floral crown has the most beautiful autumn shades in it too! Super digging the autumn themed flower crown! Lovely. lovely picture!!! I just found ur blogs, and its so nice!! 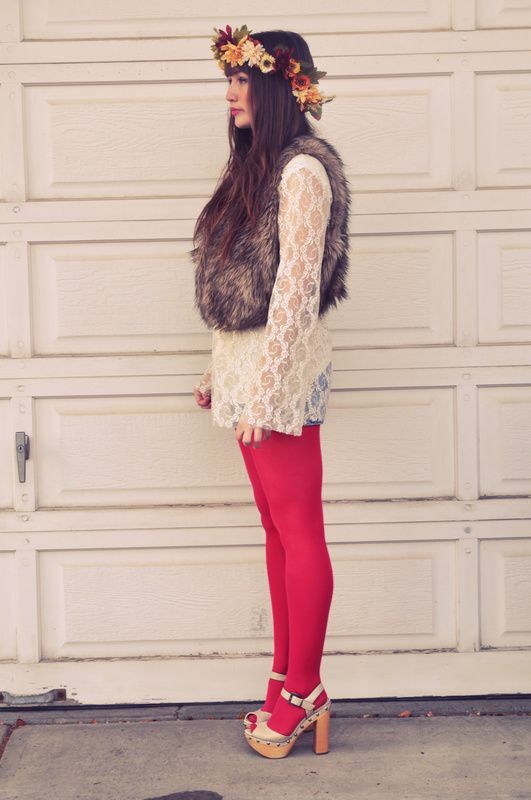 Wow, what an incredibly eye-catching outfit, especially with those red tights! You really have an amazing sense of style, so much more sophisticated than someone in their teens. You've got a terrific future in fashion design, if that's where your heart may take you. You look so lovely and pretty...I like you share it.